Schlock Treatment: 30th June 2007: Japanese Rubber Monsters part 2! 30th June 2007: Japanese Rubber Monsters part 2! Welcome to Gamera The Flying Turtle movie #4, after War Of The Monsters and Return Of The Giant Monsters, purchased and dubbed into English by AIP for American television. If you were just a tiny tot in the late 60s and early 70s these rubber suited Japanese space operas were regulation Z-grade viewing. 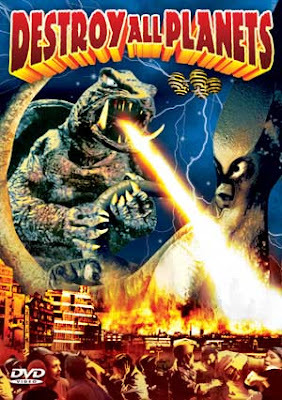 But if you’ve never seen or heard of Gamera before, you’re in for a treat: a journey into the nether regions of tacky Japanese monster movies guided by the flame shooting out of a flying turtle’s arse. Destroy All Planets from 1968 starts off promisingly: within the first ten minutes Gamera defeats an invasion force from outer space housed in the coolest spaceship that looks like inner tube lined with bumble-bee bottoms. Then, being a Gamera film, the kids take over the asylum, and the film degenerates into a pre-teen scout adventure where two tykes are actually allowed by top Japanese scientists to test-drive their new submarine. “Oh, go on...” And wouldn’t you know it - Gamera just happens to sail past them doing the breast stroke. “Gamera is our FRIEND!” you hear them shriek with delight. Luckily the invasion force returns, and they capture the mini-heroes, before watching Gamera’s previous fights with knife-nosed Barugon and would-be pterodactyl Gaos on a tele-screen as a kind of greatest hits package. And we’re not supposed to know that at least 20 minutes of the film is recycled! At least when the Simpsons do it, they can make fun of the process. Oh well. Back to Gamera, who after freeing himself from the invaders’ powerful mind control, must rescue the little bastards AND Earth, and must battle Viras, an astounding-looking giant alien squid, while cheered on by his prepubescent cheer squad. Most astounding of all is that no-one bats an eyelid over monsters from outer space, least of all our terrible twosome. God I hate these kids, and I know you will too, and maybe Gamera will someday but I doubt it: Gamera is friends to all children, and so, reviving the child in all of us, here’s your friend and mine, Gamera in Destroy All Planets. From Shochiku Productions comes the the scratchings from the lowest shelf in the fridge: The X From Outer Space, or considering its main protagonist is a rubber chicken monster, the Eggs from Outer Space. The latest Mars mission to launch from Mount Fuji discovers a UFO has been blocking previous spaceships from reaching the Red Planet. An onboard cabal of German and Japanese scientists - and isn’t it heartwarming to see the Germans and Japanese collaborate on something again! - aren’t exactly the most confidence-inspiring bunch, although Lisa, the Aryan ubernaut, manages to wear a cocktail dress under her spacesuit AND manages to keep every hair in place in zero gravity. Hurrah! After a quick cointreau and trampolining on the Moon, the Mars mission continues until the flying saucer (“It looks like the world’s largest fried egg!” remarks one of the crew) coats the ship in what looks like bird poo, but on closer inspection looks like crystal eggs. Safely back on Earth, the egg hatches, the lab is trashed, and the chicken prints lead to a bloody big hole in the floor. If the crew doesn’t fill you with confidence, the earthbound scientists are less likely to. As always, the logic of scientists is empeccable: this chicken print looks remarkably like THIS chicken print... The trail of broken egg shells leads all the way to Tokyo, where it is being crushed undergoot - or under claw - by a huge glowing monster the scientists name “Gilala” - part chicken, part dinosaur with collossal drumsticks, a bar-b-q for a mouth, a staggering array of tubes and antennae out of a head framed with just one expression: of startled, open-mouthed hostility. And so it goes, zipping along agreeably and loaded with miniature sets and effects that can only be described as “cute” or “dinky”. Compared to its much bigger budgeted contemporaries like Godzilla or, God help it, Gamera, this chicken monster may be a turkey, but in the best possible sense of the word, and in retrospect the sight of a toy car being chased by a rubber claw is priceless. 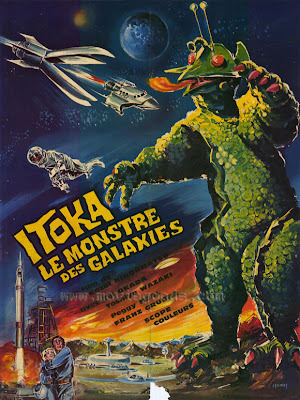 This is easily one of my favourite Z-grade Japanese monster fests, not just because there’s no annoying little monsters screaming “the giant chicken monster is our FRIEND!” No, it goes so much deeper than that; this is classic BAD movie terrain that will absolutely scramble your brain: ladies and gentlemen, The Eggs From Outer Space.